Italiensk Kulturforening i Stavanger - Julebord "all'Italiana"
Early bird registration available until Saturday 3rd December. Price after that will be 300 NOK. This year we have chosen a new venue: Skipper Worse Ledaal in Eiganes. Easy to reach and just next to the royal residence in Stavanger. 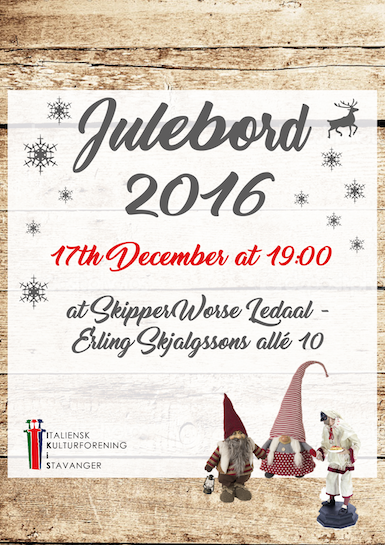 The Julebord "all'italiana" 2016 will be a family event where anyone (if you want to) can have an active part giving some help. Therefore the dress code is elegant casual, and kids are welcome. This year you can bring your own drinks (including wine and beer or other alcoholic drinks). As usual we will also have options for food allergies, so please tell us of any allergies in the registration form. The full menu will be distributed a little later. If you wish to help before the event (preparing food, arranging the room, etc. ), during the event (help in the kitchen, entertainment, etc.) or after the event (cleaning up), please email webadmin@ikis.no before registering. Note that one registration per person is required, including kids. You can use again the parent email address.